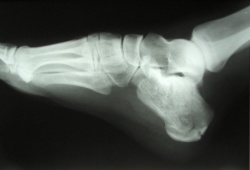 Preferred radiograph view is a dorsoplantar view in weight bearing. 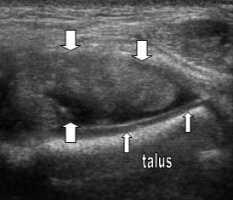 Typically a T2 weighted image from an axial view is used to detect tears in the ATFL. Ligamentous injury is indicated if there is discontinuity, a wavy or curved contour or increased signal intensity within the ligament. 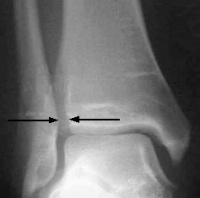 Ligamentous injury is indicated if there is discontinuity of the ligament or the ligament is hypoechoic. 3 views taken in single leg weight bearing. Look for gapping or “clear space” in the posterior aspect of the syndesmosis. >5 mm measured on an AP or mortise view is considered abnormal. 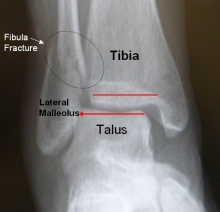 An axial view of T1 and T2 weighted MRIs can be indicated to determine syndesmotic ankle sprains. 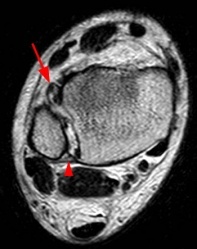 Positive MRI findings for syndesmotic ankle sprains on a plain T1 or T2 weighted image are abnormal course, irregular contour or increased signal intensity. 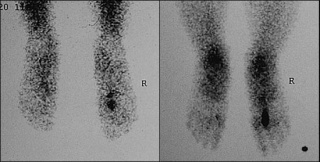 A positive finding on a T1 weighted image with contrast is marked signal intensity. 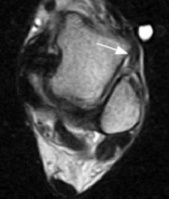 Additional positive findings with be discontinuity or not being able to visualize the ligament. 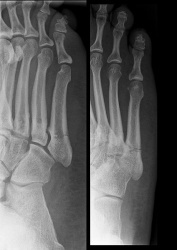 Observe lack of congruency in a bone and/or a low radiodensity black line through the bone. Using a lateral view in non-weight bearing observe lack of congruency in a bone and/or a low radiodensity black line through the bone. Observe increased uptake of the radioactive compound at the area of injury.